When I first upgraded to my DSLR camera and started using it extensively, I found myself facing a whole variety of problems, and for many of them, I couldn’t find easy solutions online or in any of my beginning photography books. I realized much later that some of these problems were so basic and fundamental that experts who had been shooting for a long time had likely forgotten that they had ever not known how to do such things. Sunset in Cancun, Mexico. Sunsets can be tricky to get the right exposure. This is the second article in an occasional series aimed at beginners called “Things Experts Forgot to Tell You” or “Things that You Forgot you had to Learn.” (The first article is Why Won’t My Lens Focus?) Maybe you’ve just purchased your first DSLR camera or perhaps you’ve had one sitting around for awhile that you’ve been meaning to start using. The next big steps are getting out there, figuring out what you and your camera are capable of, and learning where to get answers to your questions. While the first two steps are up to you, this series is an attempt to briefly cover some of the questions that might not have yet occurred to you to ask. What is ‘Correct’ and ‘Creative’ Exposure? Photography books, blogs, and manuals are full of information about exposure, but initially, I had a very hard time sorting out what they all were talking about. Some speak of ‘making an exposure’ when they simply mean ‘taking a photograph.’ Others talk about ‘exposing for a specific element in the picture’ or choosing the ‘correct’ or ‘creative’ exposure. Exposure is calculated by your camera. Each camera has a sensor that analyzes the scene in the viewfinder and chooses a combination of shutter speed, aperture (f-stop), and ISO to make what it deems a ‘correct’ exposure: where the colors and highlights and lowlights seem to accurately represent the scene being photographed. There are many different ways that this determination is made. Many point and shoot and DSLR cameras have scene modes, such as portrait, macro, landscape, action, nighttime, etc. that use different settings to match what the camera thinks works best for that style of picture. Even when shooting in program, aperture-priority, or shutter-priority modes, there are different ways that the camera can calculate exposure. (On a Canon these metering modes are known as evaluative (or matrix), partial, spot, and center-weighted average. For the majority of scenes, evaluative mode will suit you just fine, but more on that later.) 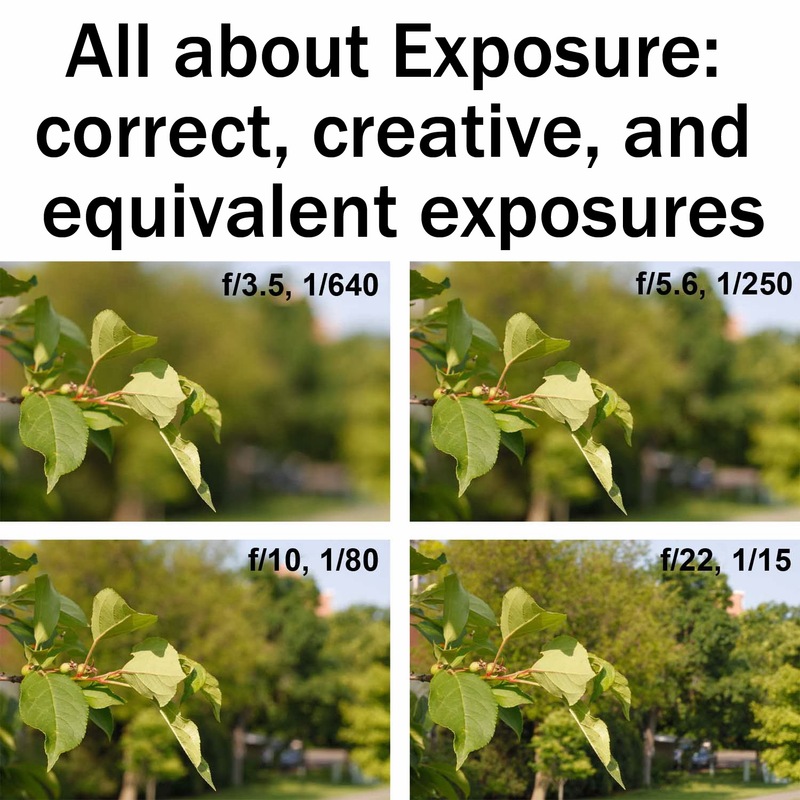 There is more than one ‘correct exposure,’ however, and these are known as equivalent exposures. This is easier to explain with an example. Let’s say that I am shooting in Program Mode with evaluative metering, where I set the ISO and the camera determines both the shutter speed and the aperture. I’m outside on a sunny day, so I’ll leave the ISO at 100 (the lowest or native value on my camera), and the camera suggests an exposure of 1/200 at f/9. If I twirl the dial to adjust those values, I will get pairs that represent the equivalent exposures – the same amount and quality of light being recorded by the sensor. Examples here include, say 1/60 at f/16 or 1/500 at f/5.6. I can choose any of these pairs of values, and they will represent what the camera has determined to be the correct exposure. Creative exposure is anytime that you, the photographer, override the camera’s suggestion. You can choose a creative exposure in aperture priority, shutter priority, or manual mode, by adjusting the shutter, aperture, or ISO to values other than those suggested by the camera. You can choose a creative exposure in program mode by using exposure compensation to tell the camera to deliberately over- or underexpose the shot. The images below were shot using exposure compensation to under- and overexpose the picture by one stop each. 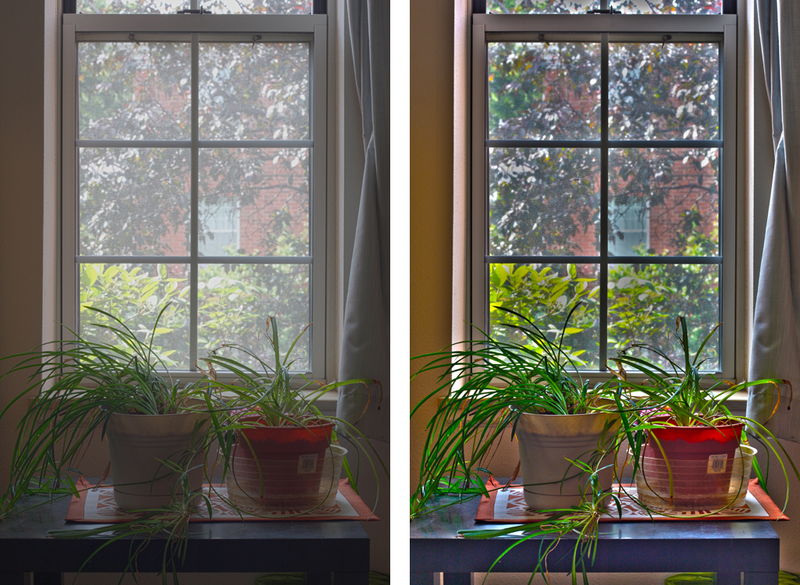 A comparison between a deliberately underexposed (left) and overexposed (right) version of the same subject. If you want a darker, moodier shot, you would select an exposure that is lower than the one suggested by your camera, which would underexpose the picture and make it darker. Likewise, if you wanted a bright shot with a white background, you would select an exposure that is higher than the one suggested by your camera, which would overexpose the picture and make it lighter. 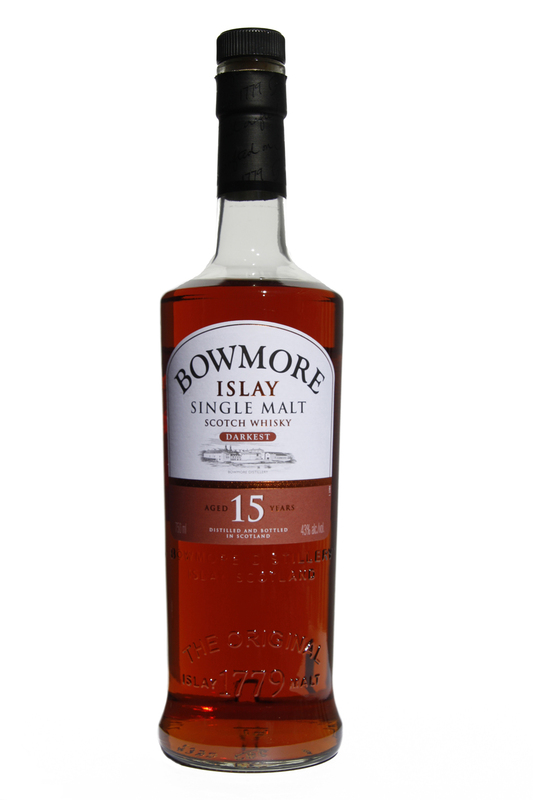 This high key product shot was deliberately overexposed (according to the camera's exposure reading) in order to bring the background to pure white and emphasize the bottle. Is there an easy way to control what the camera is exposing for? Photographers, books, and guides also often refer to exposure in a more specific sense, the idea that you want to ‘expose for’ a specific element in a picture. This gets at the issue discussed above. If you are taking a picture of a black dog, you probably want that black dog (the subject) to be correctly exposed, rather than turned into a lighter gray dog. 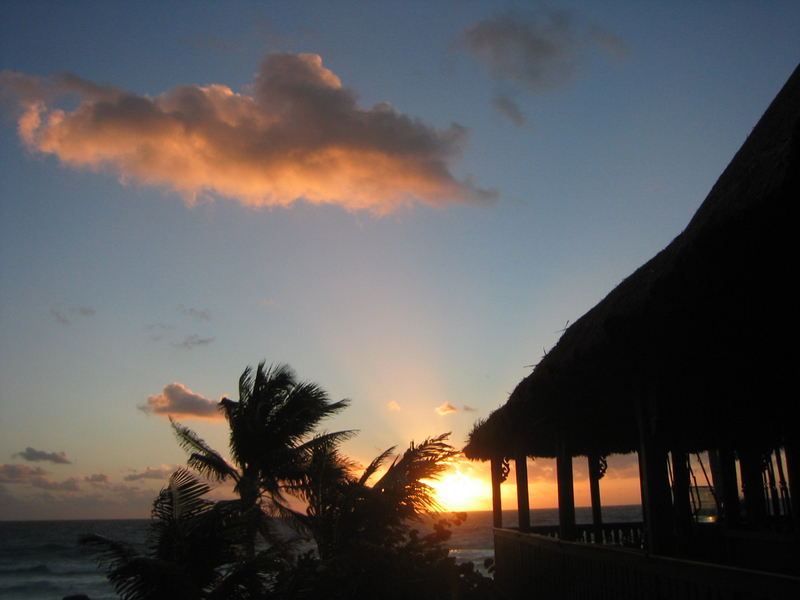 Likewise, if you are taking a picture of a palm tree at sunset, you may want the camera to expose for the sunset, turning the tree into a black silhouette (like in the photograph at the top), rather than try to expose for both the sunset and tree, which would dim the sunset colors and bring unnecessary detail to the tree. There are different metering methods that your camera can use, which I mentioned earlier: evaluative (or matrix), partial, spot, and center-weighted. Evaluative and center-weighted take into account the whole frame when calculating the exposure, partial takes into account only the center section of the frame, and spot takes into account only a very small area at the center of the frame. All of these place more emphasis on whatever the lighting is in the center of the frame (with partial and spot excluding everything else). If what you want to be exposed correctly is not in the center of the frame, such as the sunset and clouds, then you will need to lock in the exposure. The top shot chose an exposure of 1/60 @ f/6.3 based on the darkness of the bison. The bottom shot chose an exposure of 1/320 @ f/7.1 based on the lighter grass. 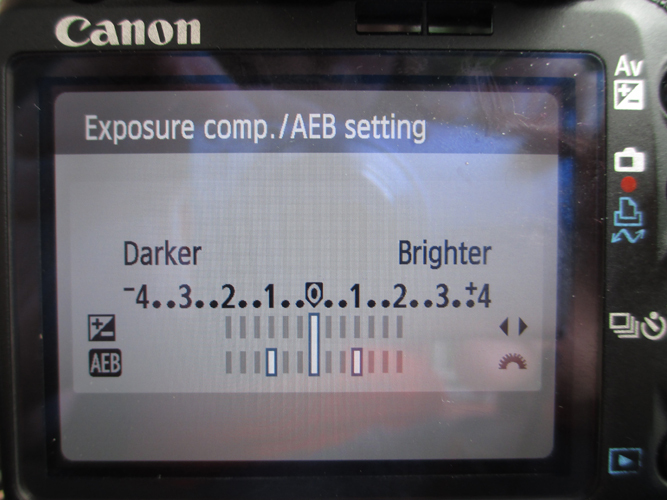 You may need your manual to find the AE lock (automatic exposure lock) button on your DSLR. (On my Canon T1i it is indicated by the * symbol.) The AE lock button tells the camera to calculate its exposure reading based on whatever the camera is pointed at when you press the AE lock button, rather than on whatever it is pointed at when you click the shutter. With the example of the bison above, when I took the first image, the camera used the dark bison at the center of the image to calculate the exposure value, which resulted in an overly bright and washed out background. For the second image, I moved the camera to point at an empty area of grass right next to the bison, pushed the AE lock button to set the exposure for the grass, and then recomposed for the bison and took the picture. 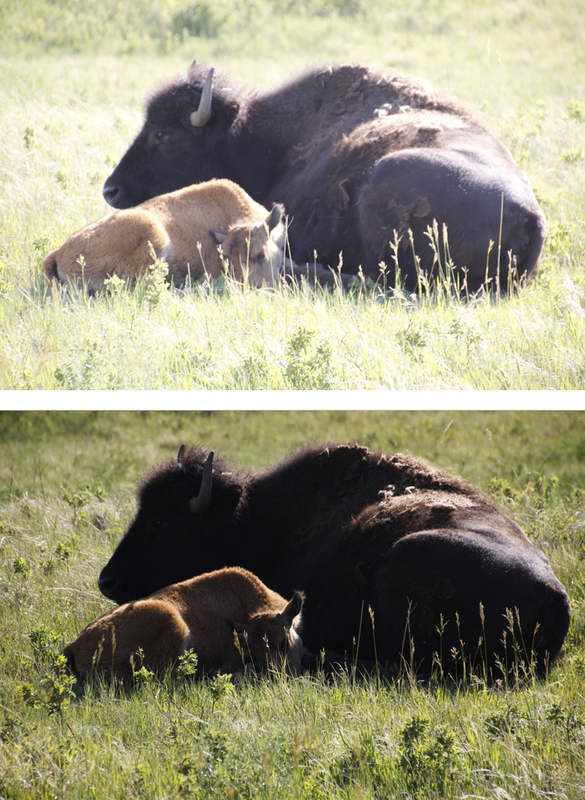 Now the grass is properly exposed, and both bison more accurately reflect their colors. 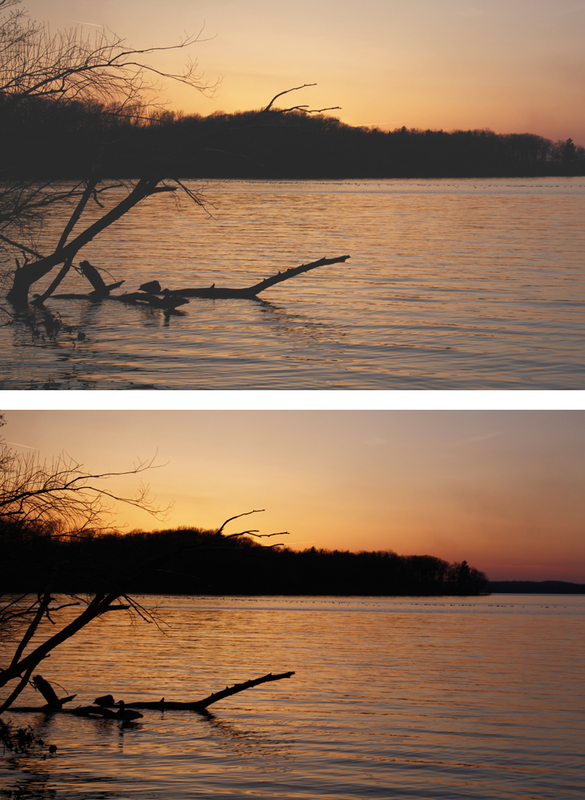 The bottom shot was exposed for the sky and reflects more vibrant colors in the sunset. For deep, bright sunset colors and dark silhouettes, the trick is to expose for the sky (not the clouds). Set up your shot, then point the camera at the sky, press the AE lock button, recompose, and take your shot. You can see the difference in the two images above. For the second, the camera chose a slightly faster shutter speed to underexpose the image (relative to the first), which resulted in the deeper colors. Another option for sunsets is to bracket your shots and take both over- and underexposed versions. Bracketing is the process of taking more than one picture across a range of exposures, and there are a few reasons you may want to consider bracketing certain shots. One reason that photographers choose to bracket shots is for later use in HDR (high dynamic range) photography. Our eyes can see a greater range of light than our camera – we can look outside a bright, daytime window and see both the bright objects outside and the dimmer objects inside. If you try to take a picture of a bright window, however, you will have a difficult time and will have to either take a shot with the bright objects outside correctly exposed (with a darkened interior) or with the dimmer interior correctly exposed (and a blown out or perhaps all white window). With HDR photography, you would take a series of two or more shots at different exposures (here, one exposed for outside and one exposed for inside) and then combine them into one image later using HDR software. Some photographers are critical of the ‘overdone HDR’ style that has been digitally manipulated to have unreal colors and tones. Another reason photographers choose to bracket shots is when there is rapidly changing light. I often use exposure bracketing when I am shooting sunsets or the moon rising. The quality and color of the light is often changing rapidly, and exposure bracketing allows me to capture a range of images (lighter and darker) and decide later, on the computer, which ones are my favorite exposures for each situation. Compare the three versions of the moon rise shot below. Some might prefer the dark tones of the underexposed version (left), while others might prefer the brighter blues and bigger glow of the overexposed version (right). When I first started seriously taking photographs with my DSLR, I found exposure to be a particularly overwhelming concept. What I was missing was the big picture: that exposure is simply the camera determining which settings it thinks will make the best picture, based on the available light, and that there are different combinations of settings that will give you the same (equivalent) exposures. You are smarter than your camera (even if you doubt that fact), and there are times when you and your camera are going to have a difference of opinion about the exposure you are looking for. This is when it can be helpful to use exposure compensation to deliberately over- or underexpose your image to achieve the look you want. Or you can use the AE Lock to ‘tell’ the camera what you have determined is important for the exposure calculation. Or you can bracket your shot to capture multiple different exposures and choose the best later (or combine them in post-processing). Controlling exposure to match your purposes will make a huge difference in your photography.